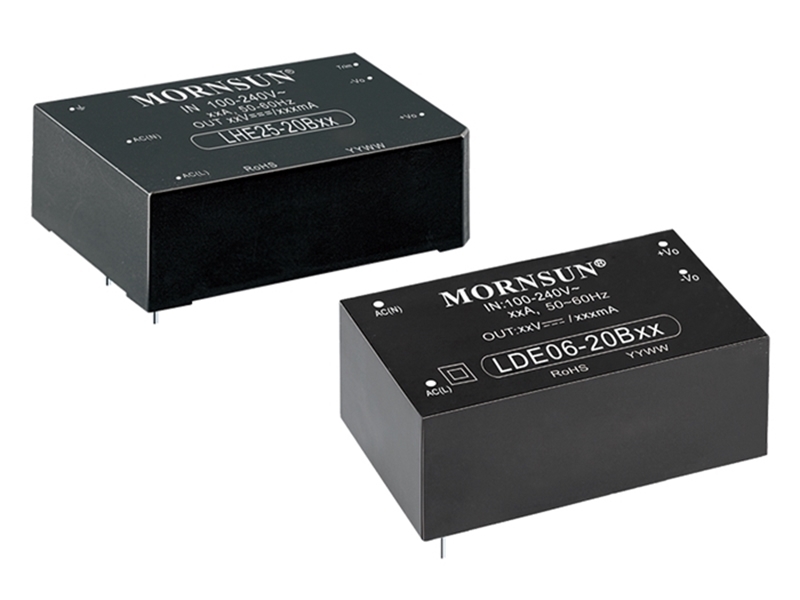 Mornsun launched new LDE/LHE series with high isolation cost-effective compact size AC/DC Converters, LDExx-20Bxx and LHExx-20Bxx series. The two series are upgraded with technology and process innovation and achieve improvement in so many ways like performance, size and etc. Product design complies with IEC62368, UL62368 and EN62368 standards (pending). i) Wide operating temperature range. LDE series provide -40℃ to 70℃ and LHE series -40℃ to 85℃. ii) High isolation: 4000VAC. It effectively improves product reliability and protects the system safety. iii) EMC: EMI performance meets CISPR32/EN55032 CLASS B.
i) LDE/LHE series integrate internal components, the volume decreases by 20%. ii) Product consistency, reliability and performance are further improved and the price is more competitive thanks to upgraded automation technology. The series have a MTBF over 300,000 h and provide protections of output short circuit (OSC), output over-current (OCP), output over-voltage (OVP), which not only significantly reduce the failure rate of the converter itself but also enhance the safety performance of back-end power modules and the load in abnormal working conditions. LDExx-20Bxx series provide powers of 3W, 5W, 6W, 10W, 15W and 20W, yet LHExx-20Bxx series of 5W, 10W, 15W, 20W and 25W. For more details, please refer to the datasheet or consult our sales. Widely used in LED, street lighting control, grid power, instrumentation, industrial control, communication and civil applications. Low ripple & noise: 50mV TYP.